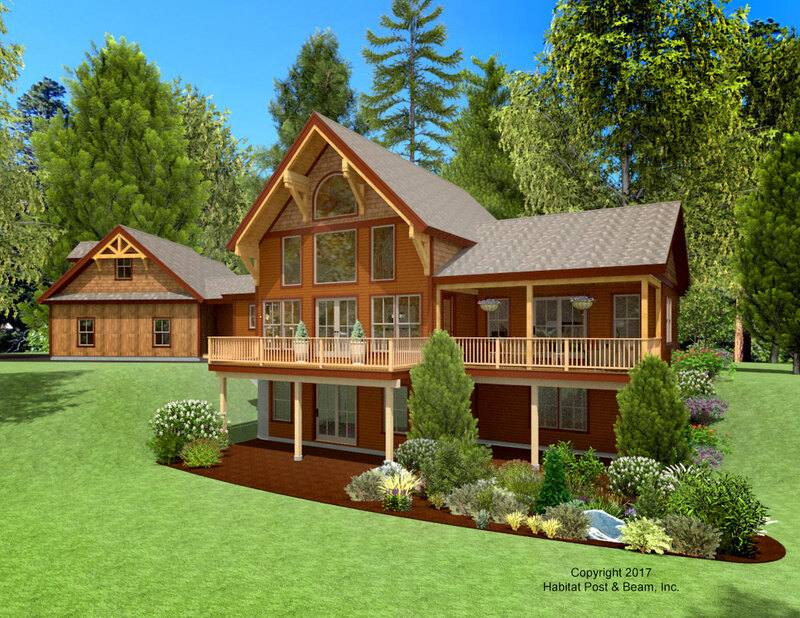 Based on our popular Lodge series, (http://www.postandbeam.com/plans/filtered?type=houses&houseDesignGroup=lodgeHomes&keywordSearch=), our latest design has about 2200 sq. 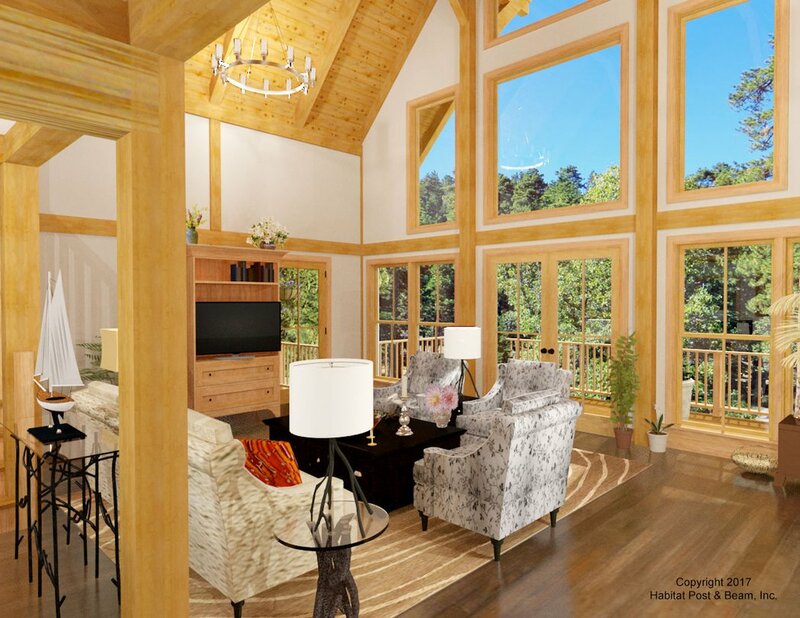 ft. of living space, and will be built on a wooded property in the Five Colleges area of western Massachusetts. The main level is about 1700 s.f. 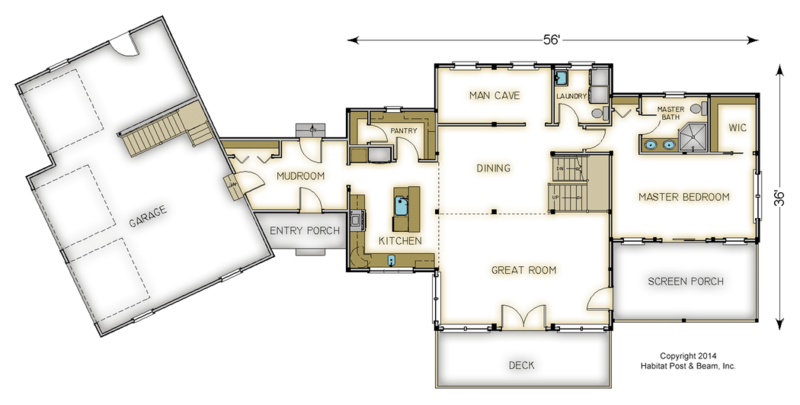 and has a central great room toward the rear, the dining room in the middle, and a den (which could be used as an additional bedroom if necessary) and a half-bath with laundry toward the front. 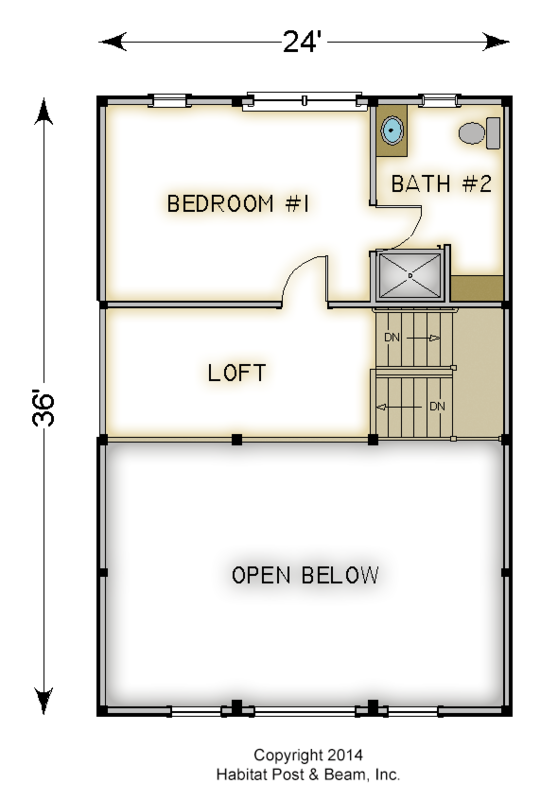 The right side is the kitchen and pantry, and the left is the master bedroom suite with a screen porch. All areas use our standard Beamed Wall System (http://www.postandbeam.com/wall-framing-system), and are under a Beamed Cathedral Ceiling (http://www.postandbeam.com/roof-framing-system) except for the den and half-bath’s flat ceiling (Plaster & Beam Mid-Floor http://www.postandbeam.com/floor-framing-system). 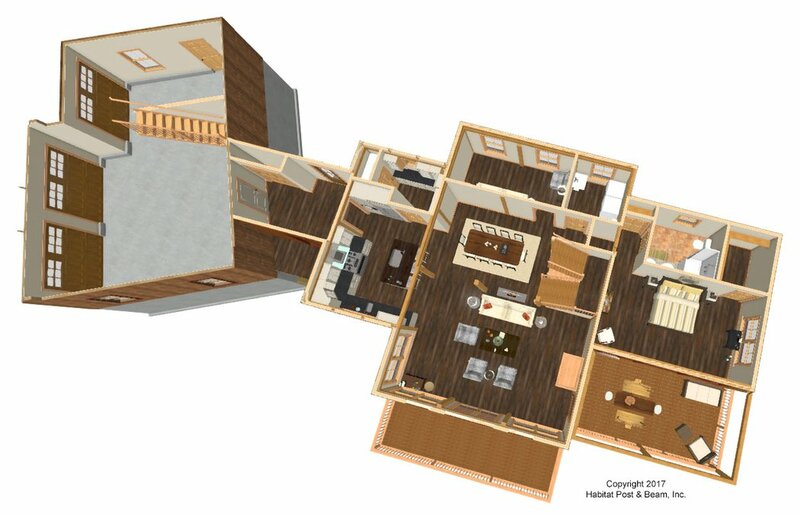 The main level’s three-car garage and mudroom connector are not included in the Habitat package. Upstairs has a second bedroom and a full-bath under a Beamed Cathedral ceiling, and a loft that looks down onto the living area below. A storage area, hobby room, additional full-bath, and a central rec room are all designed into the walkout basement level of about 875 sq. ft.
Package Price: $197,000 as specified below (from $160,500 to $208,000 depending on framing options). The standard price includes our Beamed Wall System, Plaster and Beam or Beamed Mid-Floor System (same package price) and our Beamed Roof System. The screen porch is our Beamed Porch System with a cathedral ceiling. The walkout level (daylight basement), garage, and mudroom are not included in the above pricing.